Members of a family grieved yesterday as fire engulfed a house on Likini Street in Salt Lake that was home to 21 people. 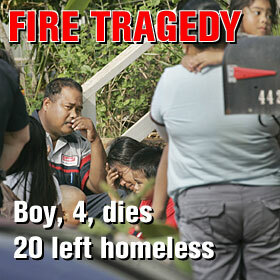 A 4-year-old boy died in the fire. After more than an hour and a half of searching for the youngster, firefighters discovered the body of a child, presumably the boy's, inside one of the bedrooms.